6" x 30' Rolls of Reflective Chevron Striping Tape. Easy to install. Just peel and stick to a clean, dry surface. NFPA 1901 states that firetrucks and emergency vehicles shall have alternating yellow and red chevron striping applied to 50% of the rear of the vehicle. The 6" stripes must slant downward from the center at a 45 degree angle and must alternate red and yellow. Fluorescent Lime/Yellow V92 Prismatic is also acceptable. We carry reflective chevron striping in five types or grades of tape. Flexible Engineer Grade Type 1 (bright), High Intensity Type 3 (brighter),V98 Prismatic (conformable & our most popular tape), V82 Prismatic Type 5 (very bright) and Crystal Grade Type 8 (brightest). All five are compliant with the NFPA 1901 standard. You can select which grade you would like by using the drop down menus below. For diamond plate reflective applications we recommend that you visit our site www.reflectiveshapes.com . For more chevron material and premade panels visit www.chevronpanels.com . All of our reflective chevron striping materials meet the minimum standards for chevron striping established by the NFPA. The minimum requirement is Type 1. We carry 6 types of material for chevron striping. They vary in brightness and also in price. 1. Our "Flexible Engineer Grade Type 1" striping tape is the most flexible and least expensive of the reflective films. It will stretch and conform better than any other reflective tape. Heat from a hair dryer or heat gun enhances this characteristic. For areas where the material needs to stretch to conform this is the best choice. Rolls are $169.99 each. 2. Our "High Intensity Type 3" striping tape is about 3 times brighter than engineer grade tape and is an affordable alternative to prismatic tapes. It is characterized by a honeycomb pattern. It is flexible but does not stretch like the engineer grade film. It performs well on smooth surfaces. Rolls are $219.99 each. 3. Our "V98 Conformable Prismatic" is our MOST POPULAR tape for creating chevron striping. It is the easiest tape to apply. It features a repositionable adhesive combined with conformability. It is flexible and does stretch a little. The yellow is actually a fluorescent lime yellow and is much brighter than the standard school bus yellows. It is extremely bright day and night just like the V92/97. 6" x 150' rolls run $419.99. 4. Our "V82 Prismatic" tape is a type 5 film and is a little brighter than the V92. It also has a 10 year outdoor rating versus the 5 year rating for the V92. It is a thin, flexible film and performs very well. It is flexible but does not stretch. 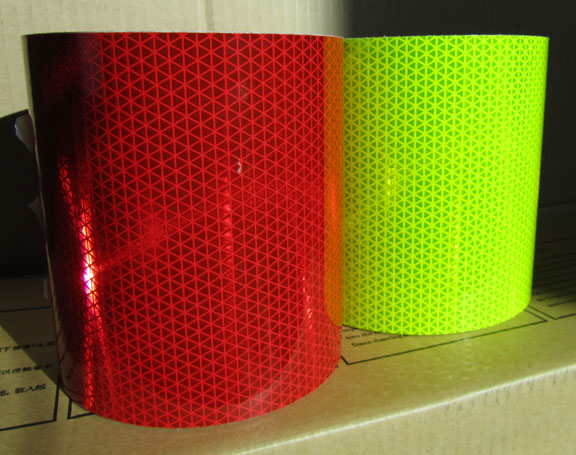 It is Reflexite's top of the line reflective tape and performs well on smooth surfaces. Rolls are $429.99 each. 5. Our "Crystal Grade" tape is a very thick and tough tape that is often seen on the brightest street signs. It is a 10 year type 8 film and is the brightest of all the chevron striping tapes. It is roughly the thickness of a guitar pick and performs very well on flat, smooth surfaces. Rolls are $499.99 each. All of our chevron striping rolls are 6 inches wide. 30 foot rolls are available on this page. Please note that the V98 yellow is a fluorescent color meaning that is it much more vivid and brighter in the day time than the other grades. It is closer to a true yellow whereas the other yellows are similar to a schoolbus color.